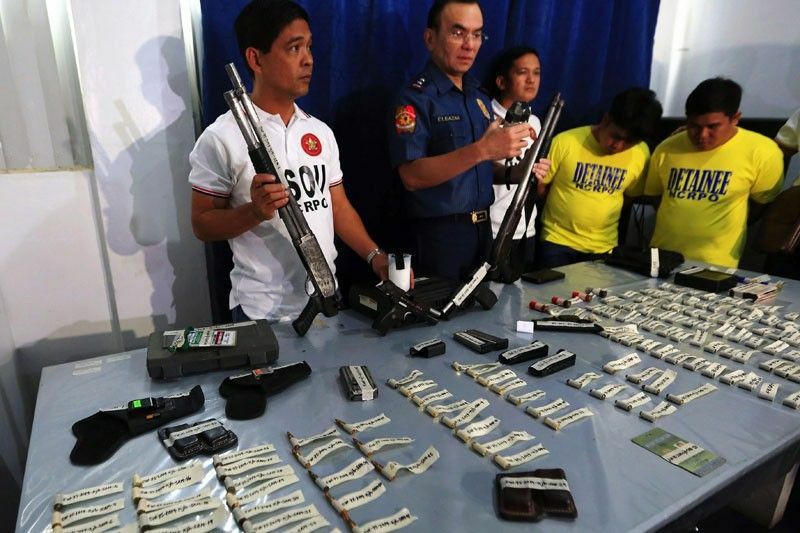 MANILA, Philippines — Two Parañaque City government workers were arrested in a raid on their house in Barangay San Dionisio Monday morning. Police officers seized two 12-gauge shotguns, two .45 caliber pistols, two fragmentation grenades and 72 bullets from the home of brothers Salah and Salman Mohamad at around 4:45 p.m. Monday, according to Director Guillermo Eleazar, National Capital Region Police Office (NCRPO) chief. He ordered a manhunt for the Mohamad brothers’ father, Salih, the subject of the search warrant issued by Judge Noemi Balitaan of the Parañaque Regional Trial Court Branch 258. Salih was not around during the raid. Superintendent Rogath Campos, Regional Special Operating Unit (RSOU) chief, said an informant went to his office, claiming Salih and his children – armed with handguns and hand grenades – protected drug pushers in their barangay. After several days of surveillance, Campo said the RSOU confirmed the Mohamads’ illegal activities and applied for a search warrant. Another suspect, Allan Acmad Barudi, tried to escape during the raid by jumping from a second-floor window. He is under tight security at a hospital, where he is confined due to head injuries. During yesterday’s press conference, the Mohamad brothers said their lawyer would answer the charges against them in court. They were charged with illegal possession of firearms and explosives and violating the election-related gun ban. Mango vendor in Alabang Market victimized by pickpocket; Watch the video here.